Red LED indicates alarmThe presence of metal will be indicated by an audio warning tone and a red light coming on. The sensitivity is adjustable. Passport Defender operation is completely automatic, using Audio and LED indicators toannounce the presence of a metallic object. Also is has 15 leveldetection indicator signal lights, showing the size of the metallicobjects from green to yellow to red colours, and more detail by numberof lights. Passport Defender detects all conductive metals including ferrous, non-ferrous and stainless steel. Passport Defenderoperatesin a very low frequency range and is therefore completely safe for bothoperators and subjects in all scanning operations, even when involvingpregnancies or medical electronic devices such as heart pacemakers. Operationis completely automatic, using Audio and LED indicators to announce thepresence of a metallic object. Also is has 15 level detection indicatorsignal lights, showing the size of the metallic objects from green toyellow to red colours, and more detail by number of lights. to contact us. We will be at your service anytime. The Garrett SuperScanner metal detector has been a long-time favorite of law enforcement professionals around the world. 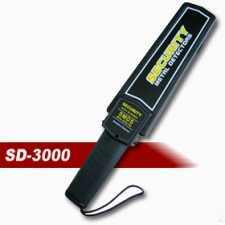 The SuperScanner metal detector virtually eliminates the need for pat downs during weapons screenings, saving patrons from embarrassment and helping to protect police officers from needles and other harmful paraphernalia. The Garrett SuperScanner metal detector features a sensitivity reduction switch to help minimize rebar interference while scanning at ankle level. 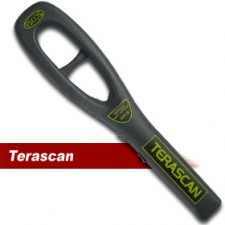 Large scan surface of this metal detector enables quick and thorough scanning. 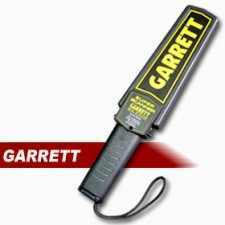 The Garrett SuperScanner metal detector uses a 9-Volt battery. The presence of metal will be indicated by an audio warning tone and a red light coming on. The sensitivity is adjustable. A 38 caliber hand gun will be detected at 7.75 inches on low sensitivity and 11 inches at optimum sensitivity; A pen knife will be detected at 4 inches on low sensitivity and 6 inches on optimum sensitivity; A razor blade will be detected at 2 inches on low sensitivity and 4 inches on optimum sensitivity; Heavy duty construction, case is 50% thicker Easier switching between high or low sensitivity modes 20% larger scanning area than other design. 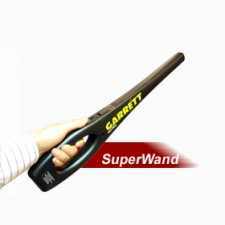 The SuperWand’s rugged injection molded construction features a structurally separate coil for increased impact absorption. Available with rechargeable battery and charger kit as option. The Garrett THD Tactical Hand-Held Metal Detector with Holster 1165900 is a rugged, compact hand-held metal detector with a 360° detection field and silent screening. 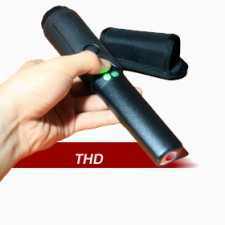 The Tactical Hand-Held Detector (THD) by Garrett features a highly sensitive and quick response that effectively detects all types of metallic objects. These objects are indicated by silent alerts with vibration and a red LED, giving officers the tactical advantage while scanning and retrieving metallic items. The Garrett THD ‘s 360 degree detection area allows for unrestricted scanning angles of the subject, especially in hard-to-scan areas. The Garrett THD Tactical Hand Held Metal Detector also features a bright LED flashlight at the tip of the detector that illuminates an area in lowlight and night applications. 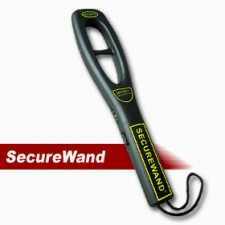 The high sensitivity HP140 Hand Held Metal Detector is designed to conduct effective searches of individuals and items such as clothing, baggage, correspondence, etc. It is highly sensitive to both magnetic and nonmagnetic metals and accurately detects weapons, detonators or other small metal masses. Its ergonomic design enables rapid security screening and reduces operator fatigue. Conforms to the international standards currently applicable for Electrical Safety and Electromagnetic Compatibility (EMC) and to applicable EC regulations.